Powertrain covers the engine, shifting mechanism, differential and drive shafts, engine cooling system, exhaust system, air intake, fuel intake and we will also be working closely with the electronics team to control the engine systems. 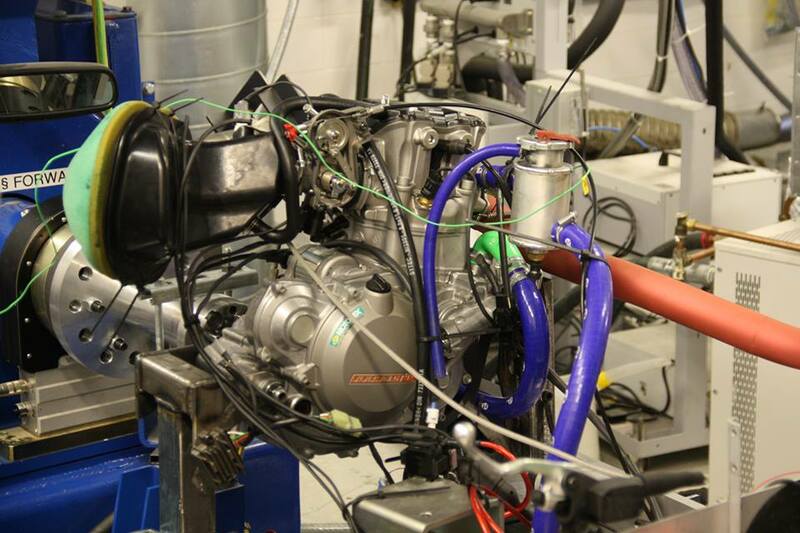 Last year we used a KTM single cylinder 450cc bike engine with fuel injection. Rules dictate that all air that goes into the engine must pass through a 20mm restriction, we therefore make a custom plenum to smooth out the air flow into the engine. The cooling system consists of a single side mounted radiator and the exhaust is the stock muffler from the bike with a few modifications and a custom exhaust pipe. We use a limited slip differential made by Drexler and new to the car last year is a steering wheel button actuated pneumatic shifter with an onboard air compressor. This year we will be replicating the powertrain system from last year but with a few changes. 1. Developing a new muffler to comply with noise regulations at FSUK. 2. We will be developing a new plenum to improve the air intake setup. 3. Constructing carbon fibre body panels and side pods, helping to direct cold air around the engine and force air through the radiator.